The first step of any magickal working is to be absolutely certain that you desire the outcome of your ritual. The Faerie Folk are wild and live their own lives with their own rules and codes of conduct. If you are sincere and honest in your approach you may make a delightful friend and ally, BUT if you are frivolous, or rude and do not speak truthfully you may be in for some tricks! If you find that your Faerie contact is too powerful for you, or if you feel uncomfortable, simply end the visit. This ritual is best done outdoors, in a quiet place where you will not be disturbed. Create a Circle of Protection around you and ask for the assistance of your Spirit Guides, Familiars, Ancestors and the Goddess and God. Close your eyes and focus on the darkness that lives behind your eyelids. You will notice that it isn’t really completely dark; you will see blobs of lighter colours and sparkles. Think about Faeries, imagine how they look, what they wear, how they may speak. 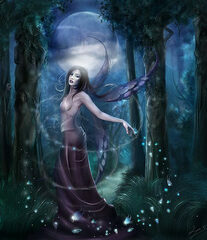 See the darkness and sparkles behind your eyelids begin to glow with a magickal greenish Faerie light. Imagine the beautiful green Faerie light swirling around you, enveloping you in enchantment. Take a few moments and enjoy the magick. Allow the enchanted light to cleanse and revive your spirit. When you feel you are ready, gently request a visit from a Faerie. Be patient, the Fey Folk are shy and wary of humans. As you wait for your new Faerie friend to arrive, concentrate on radiating friendship, courtesy, good humour, and faith. You may not actually “see” the Faerie with your physical eyes, she may come to you as a rustling of leaves, or a scent of flowers, or a musical tinkling in your mind. She may also come to you as a daydream or as a strange tingling throughout your body. Be mindful of ANY changes you feel, hear, taste, touch, dream or see. Greet the Faerie warmly and tell her your name. Ask the Faerie her name and then explain why you’ve called her and what you require of her. Simply stating your requirements or desires does not necessarily mean that she will grant them. The Fey are tricky, she may ask you to enter into an agreement or to complete some sort of task before she will help you. Beware! It’s best not to enter into any agreement with a Faerie, especially one that you’ve just met. We all know the tales of humans disappearing into a Faerie Mound for a hundred years! Matching wits with the Fey is best left to those who are very experienced. Spend some time talking to and listening to your Faerie visitor. Remember, you are trying to start a lasting friendship so conduct yourself accordingly. Bid your new Faerie friend farewell, being sure to say that you wish to see her again. Spend a few moments centering and grounding. This is an important step; you have been in the spirit realm and will not be fully present in the mundane physical world immediately. Once you feel fully grounded, release your Circle of Protection and thank your spirit guides.